Jennifer had so many activities, tasks to do each day, she lost time to care for herself. See how she cut 23% body fat in her own home, and got on stage! I don't give up when I commit to something. So when I found myself feeling insecure and hating that physique looking back at me in the mirror, I felt a sudden determination to make a change. I wanted to develop the best body I've ever had. I felt ashamed that I had given up on me, on keeping my body healthy and in shape. Each day I live a somewhat extreme life as a daywalking mom/wife with journalism and equestrian hobbies, and at night I work as an emergency veterinarian (yes, sacrificing rest and appropriate sleep). Somewhere between undergraduate studies and baby #2, I began neglecting my body and as result I felt self conscious and insecure. I, as most women, wanted that incredible body seen in fitness magazines. Unfortunately, I fell into unhealthy habits of indulging on junk food and living off fast food. I dedicate my life to "going above and beyond" so just getting fit was not going to be enough motivation to encourage me to "stick with it." I, again like many women, have tried sudden crash diets, crazy diet trends, and commercial exercise plans…and failed each one as I felt they weren't working and I didn't see the result I needed. In December of 2010, I finally decided to make the change. I was completely ready for the challenge and the commitment to build an awesome, strong body. I purchased a home boot camp video series as my starting plan. 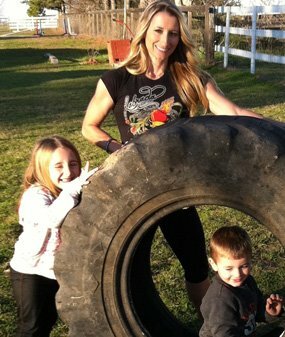 I did not want to sacrifice time from my kids to work out and did not want to join a gym for fear of intimidation. I have always been active but with sports included showing horses, cheerleading and tumbling. I had never trained with weights or with the purpose of bodybuilding. When I was researching fitness and diet info online in December of 2010, I came across a picture of Figure Pro Erin Stern and suddenly fell in love with the sport of Figure. Figure competing now fueled my motivation to work out and to eat well. It gave me the drive I needed to push myself to work out and seek professional nutritional coaching. Like many career moms, I live a hectic and stressful life and Fitness/Figure allowed me to create a new challenge for myself. I knew from researching figure/bodybuilding online that I was in for some huge obstacles including strict meal plans, the challenge of finding time from my busy day to prep and pack food, and then I needed to find the time to be consistent at my workouts. The more I set my mind to the goal of Figure competitions, the more I intended to show the world that this mom, veterinarian, wife and veterinary journalist could defy odds. I fully committed to the clean eating while maintaining a rigorous training plan in order to achieve an extraordinary physique. I had every excuse to not succeed yet felt there was not a good enough excuse not to try. I wanted to make my family proud and become a positive role model for my kids. 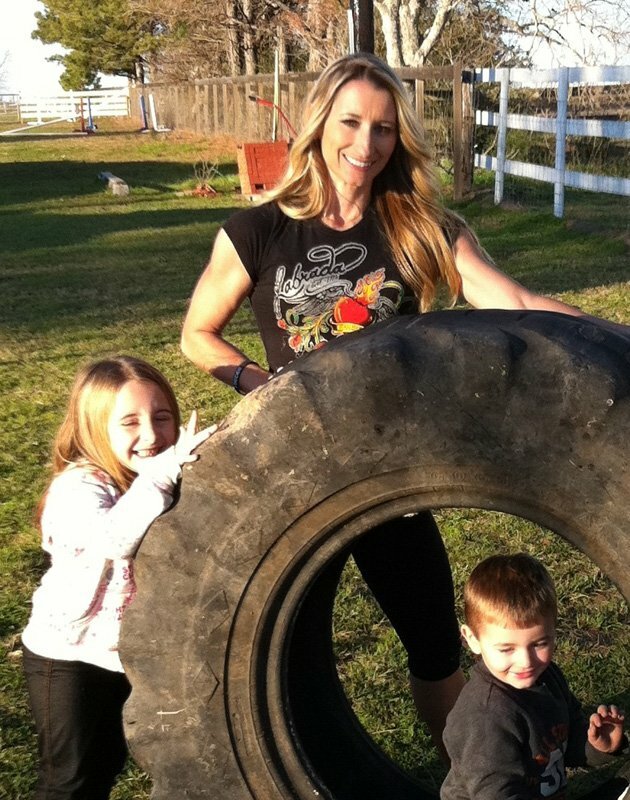 As my New Year's resolution for 2011, I began the 90-day program which allowed me the comfort of my home for training and allowed me to train alongside my kids. I had never really worked out in a gym setting or lifted weights so was grateful for a chance to learn workout techniques without sacrificing time with my family and without the intimidation of a gym setting. With the help of Dr. Chase Banks, my nutrition plans were designed for me to help meet my goals and prep for the stage (starting in Feb). His stringent plan, consistent with the standard bodybuilding diet regimen, had me cooking and prepping foods every free moment I had. I would come home from being at work all night, workout, play with my kids, prep meals, workout with my kids, then pack food, shower and go back to work! I was eating lean protein, clean foods and eating every 2-3 hours. In order to keep consistent on my diet, I had to pack my food for 17 hours at a time to have enough to eat at work. My nurses, at first unsure of this crazy fitness plan I was on, quickly developed a great team attitude and helped me grab meals and watch the clock for mealtimes in between seeing sick and injured pets. I decided to compete in my first show in April, just 8 weeks after starting my nutrition plan. I followed the boot camp program and added morning fasted cardio and track work to get my body stage ready. Though I have never even felt comfortable in a bikini around family or friends, I somehow developed an alter ego that helped me overcome anxiety and fear of embarrassment in order to get up in front of judges and strangers that April! Amazingly, I stepped on stage at 114lbs and 19% body fat and placed 3rd in bikini and 5th in figure! The experience was just the rush I hoped it would be…I was hooked. I planned my next competition for August which would be the official show of transformation completion. In order to keep my body from plateauing with the same workout routine, I joined the YMCA gym and consulted 1-2 times/month with a personal trainer. I added more track work and worked out 2-3 times per day while varying my workout plan and increasing weight with lower reps to continue improving my physique. I also continued to study the sport and develop an understanding of posing and researched how the Pros trained. If you are going to be an elite athlete, one must then keep the mindset and training of an elite athlete. The weekend before my 2nd show, I did 2 depletion workouts with Dr. Banks that forced me to exert all I had. We trained with bleachers, sprints, ropes and he kept me pushing my endurance and strength until I could push no more. I was ready. With the support of family, friends, and coworkers, I competed in the Optimum Nutrition Lone Star on August 20, 2011. What an incredible day! All of the hard work paid off! I was named both figure and fitness model champion, as well as received the Rising Star Award and was crowned the newest athlete for Michael David Photography's I Decide campaign! The journey to transform was complete and I had officially become a Figure competitor within 8 months! Day 3: AM Shoulders/Triceps, PM "100's"
First goal - new body, complete. Second goal - become a Figure competitor, complete. What's next? I aim to help encourage, inspire and motivate other women, particularly working moms, who feel they have no options to improve the body they are less than happy with. I aim to prove that it is possible to become lean and fit if you commit to yourself and stick with a plan, no matter how challenging. I want to influence others to be unstoppable. Nothing can hold me back and I want to help others feel that same way about themselves. I have continued to set new goals which include becoming a sponsored athlete, fitness model and writer, as well as a Figure Pro Athlete. Are these next set of goals easy? No way…therefore I will just push harder and will not give up. Don't give up on any goal, no matter the odds against you and always give everything you do 110% effort! If aiming to be more fit, first ignore the scale and focus on how you feel. Allow time for change - at least 4 months as a realistic time frame. Don't be discouraged if results take months to obtain because it will happen if you stick with the plan. Be focused and consistent while resisting influences (stress, peer pressure, depression, exhaustion etc). Keep your mindset positive and avoid negative thoughts or statements about yourself. Believe you are the strong, beautiful, athlete you want to be and you will succeed.